The Engelstad Foundation R.E.D. Rose program emphasizes "Responsible Early Detection" of breast cancer. The program provides free clinical breast exams, mammograms, ultrasounds, biopsies, surgical consultations, and support services to women and men, 49 years and younger, who lack adequate health care coverage. R.E.D. Rose navigators help coordinate care from initial screenings through treatment. Support services are also available—such as financial assistance with monthly utilities, transportation costs, groceries, rent, and other incidental expenses—while patients fight breast cancer. Navigators are also trained Nevada Health Link enrollment facilitators who can help clients enroll in insurance plans. "Imagine being uninsured or undocumented and finding a lump in your breast. The fear, worry, and stress is overwhelming," says Holly Lyman, Director of Community Health and Outreach for Dignity Health–St. Rose Dominican. "In the past, many of these women fell through the cracks or waited too long to be diagnosed and treated." That's where St. Rose and R.E.D. (Responsible Early Detection) Rose come in. For 17 years, the program has provided diagnostic services for breast cancer, and other aid, to women and men in southern Nevada—and the need for this help has continued to grow. More recently, funding declined significantly. In fact, in 2018, low resources meant the program had to limit services, helping fewer people than in previous years. In late 2018, the Engelstad Foundation announced a $10 million donation to R.E.D. Rose. These funds mean roughly 550 women and men in need will now be able to receive assistance from the program annually. "St. Rose and the R.E.D. Rose program have delivered on their promises," says Kris Engelstad McGarry. "We know this donation will be maximized and, in turn, equate to enhanced access to critical services for so many. We not only see this as an investment in a successful organization and program, but an investment for an even stronger future here in southern Nevada." "I am a breast cancer survivor myself, so this gift certainly hits home. Wherever we can contribute to southern Nevadans living their healthiest and happiest lives possible, we are ready to help build sustainable and impactful solutions. And, when it comes to breast cancer, early detection efforts and quality treatments are absolutely vital to our neighbors ultimately beating the disease." New hope. New name. In November 2018, Kris Engelstad McGarry received the Dignity Health–St. Rose Dominican Humankindness Award. Breast cancer survivors, all beneficiaries of R.E.D. Rose, joined Engelstad McGarry at the ceremony. 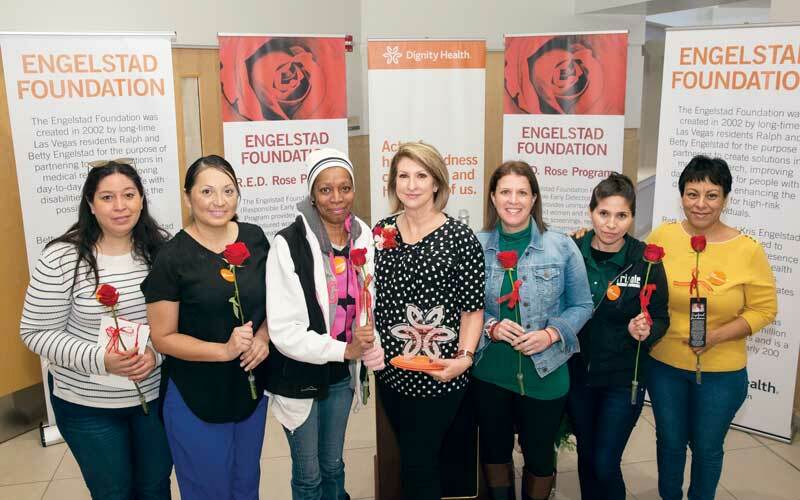 The St. Rose Dominican Health Foundation also announced the rededication of the program—now known as The Engelstad Foundation R.E.D. Rose Program. Pictured, from left, are Magdalena Garduño, Melinda Lopez, Ketrina Baine, Kris Engelstad McGarry, Jenna Castagnino, Leobarda Rivera, and Maria Contreras. Maria first learned she had breast cancer in 2005. After treatment, she was cancer free until 2012, when her cancer returned. In 2016, she was diagnosed with breast cancer a third time. That's when her doctor told her about St. Rose Dominican's R.E.D. Rose program. With assistance from R.E.D. Rose, Maria was able to get the treatment she needed, including a total mastectomy, chemotherapy, and radiation. She also received financial assistance to help her pay for rent and utilities. "Thanks to St. Rose and their R.E.D. Rose program, I was able to get the help I needed when I needed it the most," Maria says. Ketrina knew something was wrong when she started getting stomach pains and losing a great deal of weight. Then she found a large lump one day while taking a shower. "I went in for a mammogram. When my doctor called me at 9 p.m. one night, I knew it wasn't going to be good," Ketrina says. "He asked if I was sitting down and told me I had cancer." Ketrina was diagnosed with breast cancer in December 2016. She received treatment but another lump was found in October 2018. "Chemotherapy makes me really ill, so I was not able to work," she says. The R.E.D. Rose program helped pay for her food and bills. "R.E.D. Rose truly saved my life," Ketrina says. "Without their amazing staff, I literally wouldn't have been able to eat." About the Engelstad Foundation. Kris Engelstad McGarry serves as trustee of the Engelstad Foundation, which her parents Betty and Ralph created in 2002 to build and grow a legacy of helping others.